This is a huge setback as the SQL database cannot be accessed anymore, thereby restricting the access of the data stored in the SQL Server database as MDF (primary) and NDF (secondary) file. Consequently, it brings in the necessity of using a SQL recovery software to repair the damaged or corrupt SQL Server database (MDF and NDF) files easily and efficiently. This is what happens when a SQL Server database fails or crashes, and how the Stellar software deals with those situations. The SQL Server database gets damaged or corrupt with the failure of SQL Server.This may happendue to hardware issues, bugs in SQL server, OS malfunction, unexpected system shutdown, and virus attacks, etc. Irrespective of the reason, the software repairs the SQL server database. The SQL database repair software repairs the damaged or corrupt SQL database MDF file (and associated NDF file) successfully. When it is used, the result is a robust SQL Server database. The Stellar software recovers the following SQL Server objects. Others – deleted records (optional), XML data types, file stream data types, and more. Note: The software saves non-recovered views, queries, tables, stored procedures, etc. in a separate text file so that it is easy to identify the non-recovered objects. Error code 5171, 8942, 3414, etc. After the review of SQL repair software, I have comprehended the following about it. Not just the Live or new SQL Server database, the software helps to save the recovered objects in other file formats such as XML, CSV, and HTML. Thus, the recovered data of SQL Server can be accessed on multiple platforms. Displays all recoverable items of SQL Server database in a tree-like structure before saving. This helps to select and preview the recoverable data easily. The benefit of the preview feature is that you can verify whether the recovered data would be intact and in its original form. The software provides an option to search Objects with the use of ‘Find Items’. The advantage here is that users need not search the objects manually ─ which would take more time ─ from the list displayed after the scan process. Plus, users can search for intended items based on ‘Match whole word’ or ‘Match case’ criteria. This option enables users to save only the required SQL database objects. From the list of the recovered database objects, users can select the required objects and save them. The software offers to save the recovered SQL Objects at the user-defined location in addition to the default location. Moreover, it allows to save the non-recovered Objects such as queries, views, stored procedures, etc. in a text file. 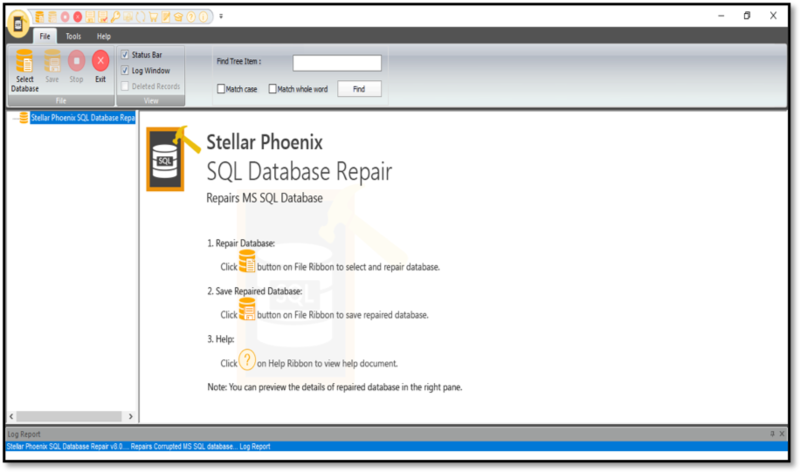 How to repair SQL databased with Stellar Repair for MS SQL Technician? The software acts diligently when the ongoing SQL database repair process gets disrupted. It reconnects automatically and completes the repair process. Next, the software automatically saves the scan information once the Scan process gets complete. The saved Scan information can be used to repair the database file at a later stage without the need to scan the MDF file again. This, thereby saves time. Whenever DBAs need to repair a damaged or corrupt SQL Server database, they can use this handy and self-explanatory tool. With its advanced GUI — a ribbon in the software interface with various options including customizable Menu items — the software is easy to use. The automatic saving of Scan information that avoids the need to re-scan, simple three-step repair process, selective recovery for SQL objects, preview of recoverable objects, saving of objects at desired location, option to save in multiple formats, recovery of SQL objects, etc. ─ all these make the software effective to deal with SQL database corruption. These multiple functionalities owe to the advanced algorithms of the software. It is comparatively better than its previous versions as well as many other SQL repair software. Nonetheless, there is a scope to increase the efficiency of the software so that it gives better results. This will make it perfect for DBAs handling SQL Server. Based on the features, benefits, and ease-of-use, I can rate the software 8 on 10. I used this tool in the past, and possibly because of the level of damage of the data file, the results were not as expected, only a small part of the full data was recovered and with many inconsistences , we decided to buy it after the initial sampling it does and that gave us conficende about the recovery results it was very promissing ! we discussed this with Stella team and they agreed to refund our money back which is very nice from them. Yes! Some data corruption is just beyond repair. I’m glad they refunded your money! The most important thing is to make sure you have good backups, “with checksum”, and test your restores. Performing DBCC CHECKDB, etc. Previous PostPrevious From System Admin to SQL Admin?